The Canada Economic Development for Quebec Regions (CED) is looking for the opinions and ideas of members of the public and economic stakeholders on the economic strengths, challenges and problems impacting Quebec’s businesses and regions as well as on the potential solutions that might be envisaged. CED is to promote the long-term economic development of the regions of Quebec by giving special attention to those where slow economic growth is prevalent or opportunities for productive employment are inadequate. In 2016, CED will be establishing a new Strategic Framework for 2016-2021 to guide its programs and services and enable the Agency to carry out its mission. To learn more, see the current Strategic Framework. The consultation period will be on until February 29, 2016. The ideas and opinions collected will be analyzed and subsequently used in developing the 2016-2021 Strategic Framework, which will take the needs on the ground into account. 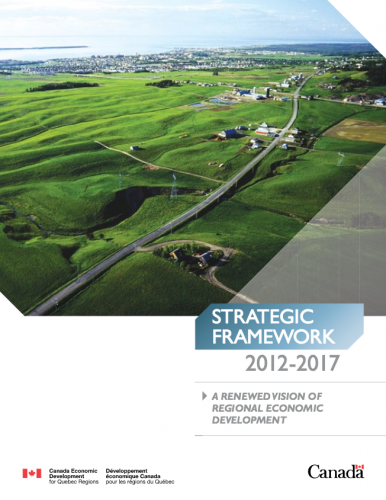 This framework will set out CED’s renewed vision for the economic development of Quebec’s regions. Responding to this call for ideas is also an opportunity to engage in open dialogue with the government and be part of the reflection on its initiatives and programs. Please note that all information shall be collected in compliance with the Access to Information Act and the Privacy Act. CED is authorized to collect personal information under Section 11(1) d) and Paragraph 12 f) of the Economic Development Agency for the Regions of Quebec Act. All information shall be treated confidentially and used solely for the purposes of this consultation. This dialogue is part of a wider engagement plan aimed at encouraging ongoing discussion with the public and regional economic development experts. The call for ideas is intended to initiate that dialogue and will be followed up with more targeted discussions with economic development stakeholders. The ideas and opinions submitted will be analyzed and the results will be presented in a report that will be posted on CED’s Website and shared on our social media sites. Keep up with the latest news by following CED on Twitter @CanEconDev and LinkedIn.